Gastroesophageal reflux disease is a condition where the contents of the stomach leak backwards into the esophagus, the muscular tube that connects the mouth to the stomach. The contents of the stomach are highly acidic, so they irritate the esophagus. The result is heartburn and other symptoms. Caffeine, a substance found in food, beverages and some over-the-counter medications often makes GERD symptoms worse. Caffeine is a colorless, bitter-tasting substance that occurs naturally in foods such as coffee, tea, cola and cocoa. Synthetic caffeine is also manufactured in a laboratory and added to over-the-counter medications and foods that do not naturally contain caffeine. Caffeine contains no calories and it mainly functions as a stimulant. Caffeine makes GERD worse, however MedlinePlus says it also causes symptoms independent of GERD, such as a fast heart rate, excessive urination, nausea, vomiting, restlessness, sleeplessness, anxiety, depression and tremors. Caffeine has special significance for people with GERD, according to University of Wisconsin professor David Rakel in the 2007 edition of “Integrative Medicine.” First, Rakel says, caffeine decreases the tone of the lower esophageal sphincter. This is the valve that keeps stomach contents from entering the esophagus and causing heart burn. This effect begins almost immediately and lasts about 90 minutes. Second, Rakel adds, caffeine stimulates acid secretion. This effect may last several hours. 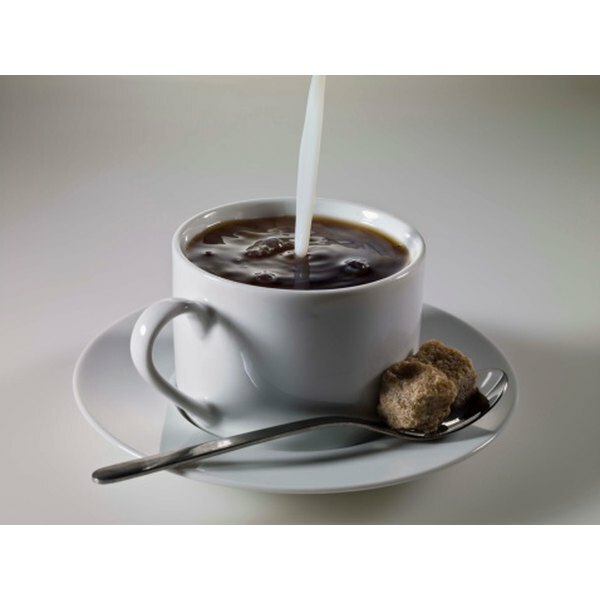 Caffeine content of foods varies depending on how they are prepared. The University of Utah College of Science reports that brewed coffee contains between 80 and 135 milligrams of caffeine per 8 ounce serving. Brewed black tea contains 40 to 60 milligrams per 8 ounce serving. At most coffee shops and quick service restaurants, 8 ounces is equivalent to a “small.” Instant coffee and tea contain less caffeine than brewed versions while decaffeinated versions contain only trace amounts. A 12 ounce cola drink -- equivalent to a single can -- contains between 30 and 55 milligrams per serving. Cocoa and chocolate contain caffeine and another substance called methylxanthine that produces similar effects on GERD. Many energy and sports drinks contain synthetic caffeine, as do some over-the-counter medications used to treat colds, pain or headaches. Read the labels to learn more. Consider switching to decaffeinated versions of your favorite drinks. However, monitor your symptoms carefully because Rakel says decaffeinated coffee and tea may increase acid secretion independent of caffeine. Tea drinkers may enjoy mata tea or herbal teas instead. These are naturally caffeine-free. Some, including ginger and chamomile teas, may soothe GERD symptoms. Tea made from members of the mint family should be avoided because they contain compounds called carminatives that may make GERD worse. If you have GERD and consume caffeine regularly, you should gradually reduce the amount you consume over a few weeks. MedlinePlus reports that stopping abruptly may lead to withdrawal symptoms such as headaches, drowsiness, irritability, nausea, vomiting, and other symptoms. For most people, GERD symptoms are worse at night, so you should discontinue evening caffeine consumption first. Since caffeine is not the only factor that affects GERD, ask your doctor about other diet and lifestyle changes.